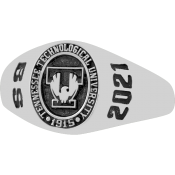 Show your TTU Pride by wearing the official Tennessee Tech ring or pendant! Each ring or pendant symbolically captures the uniqueness of Tennessee Tech University. Honoring one of the most familiar Tennessee Tech traditions, the elegant ring and pendant depict the Golden Eagle in flight. The majestic bird, wings outstretched, has represented Tennessee Tech as the campus’ official mascot since 1925. Depicting pride, honor, strength, spirit and intelligence, the Golden Eagle is a fitting symbol of the university. 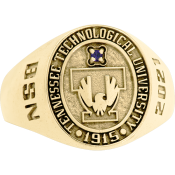 A customized signet ring with Tennessee Tech's symbol, custom-crafted in your choice of 10-kt or 14-kt yellow or white gold or Balfour premium silver and is available in both ladies' and men's sizes. The inside of the ring may be personalized by engraving the recipient’s name, initials or personal sentiment — up to 18 alpha-numeric characters or Greek letters. A special presentation box is included. Students wear the ring with the school name facing them. Upon the granting of degrees at Commencement, graduates turn the ring around, with the name facing outward. This symbolizes that the graduate is now ready to face the world. The beautiful pendant features the official Tennessee Tech symbol in your choice of 10-kt or 14-kt yellow or white gold or Balfour premium silver. Wear the TTU ring or pendant and carry its meaning with you. For more information or to place an order, visit http://www.balfour.com/tntech or call 1-866-BALFOUR. Tennessee Tech Ring and Pendant Ceremonies are held each fall and spring during the week prior to graduation. The event is presented by the Crawford Alumni Center and the University Bookstore. 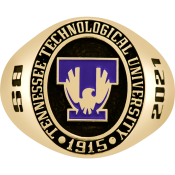 Students who order the official Tennessee Tech ring or pendant are encouraged to participate in this special ceremony that features a performance by members of the Tech Chorale and a brief account of the history and significance of the ring and pendant. The director of the Crawford Alumni Center presents each student with his or her ring or pendant. Following the ceremony is a reception with refreshments. Parents and guests are welcome to attend. Recommended attire is business casual. For more information or to make reservations, please call the Crawford Alumni Center at (931) 372-3205, (800) 889-8730 or email alumni@tntech.edu.